The trend to open temporary retail spaces in carts, abandoned storefronts, bars, and sidewalks, and has now spread worldwide and is an estimated $50-billion industry. Gap transformed a school bus with a 60’s-themed clothing line using the bus as a traveling store, and Kanye West opened his Life of Pablo merch pop-ups around the world making an astounding $1 million in two days. 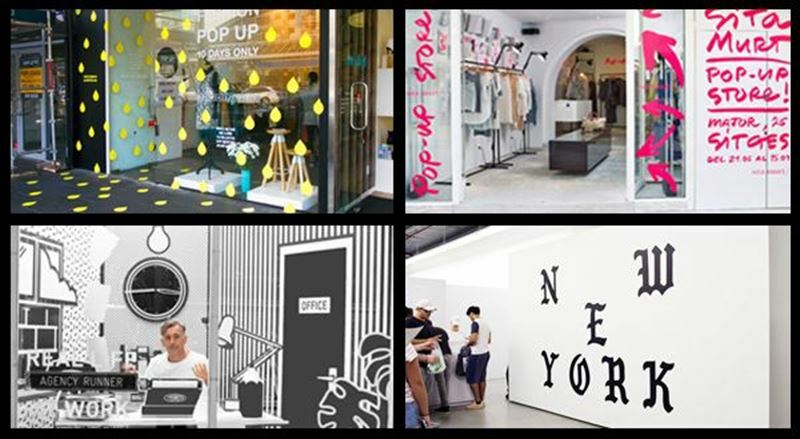 Pop-ups require novel ways to transform temporary spaces into attention-getting retail stores creating a huge, ever-changing need for indoor and outdoor retail signage. HP offers a multitude of print media to create retail applications for aqueous ink technologies to help print service providers meet the challenges of this new retail customer. HP Everyday Matte Polypropylene – a recyclable polypropylene that provides vivid POP signage and event displays. HP Opaque Scrim – a premium scrim banner that is water- and tear-resistant to withstand harsh weather conditions. HP Universal Adhesive Vinyl – a permanent, pressure-sensitive adhesive for eye-catching indoor and outdoor signage. HP Universal Heavyweight Coated Paper – a recyclable, FSC®-certified, heavyweight coated paper for posters and other retail displays.